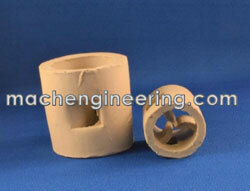 MACH Engineering offers a variety of tower packings and column internals. With MACH’s random packing, capacity increases can be achieved without sacrificing efficiency at competitive prices. To provide the most efficient packing, we design our products around a set of interrelated performance goals. Our process engineers can help you optimize performance in new or existing towers by assisting in the selection of the most efficient packings and internals for your specific application. 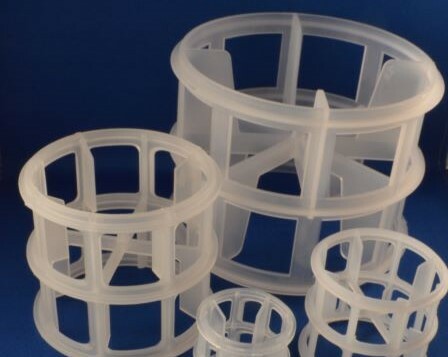 With a history of designing and engineering tower packing media, MACH Engineering is a longstanding partner to demanding clients across the country. Random tower packing is one of our largest product verticals, and we offer an extensive selection of custom and semi-custom products. 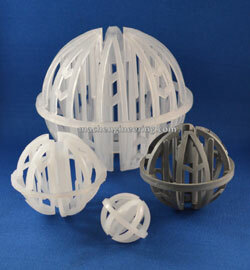 Tri-Packs® is a sphere-shaped column packing with intricate group of ribs and struts. It was introduced in 1980’s and is since recognized by its geometrical shape. Its spherical shape offers good surface area to void space ratio. There is virtually no nesting or settling since there are no obtruding edges. 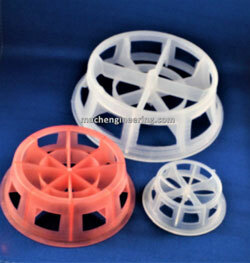 Due to circular and consistent design of each packing, high mass transfer rates are achieved. MACH Mini Rings (MMR) have cylindrical surface and linear internal braces, which provides low height to diameter or aspect ratio compared to standard cylindrical ring type packing. The low aspect ratio design ensures even liquid flow, which leads to substantially better gas and liquid contact. Its shape allows higher bed heights with little deformation and low-pressure drop across the bed. MMR was developed and commercialized in 1971. Since its introduction, MMR random packing has been utilized in a wide variety of distillation, absorption and stripping columns around the world. The superior performance of MMR random packing has been shown in thousands of successful installations by MACH Engineering, LLC. Pall Rings are conventional shaped packing that offers low price compared to other modern packing at a cost of performance. 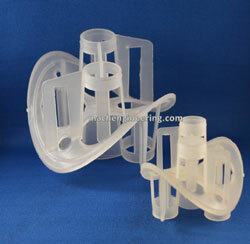 Pall Rings represent the oldest and most common type of plastic packing used over the past 40 years. Maspac was initially developed by Dow Chemical Company after a long period of testing. 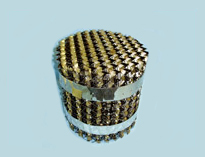 This high performance packing was designed specifically for handling very high liquid and gas flows with low pressure drop. 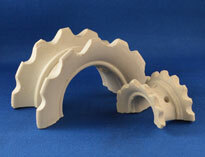 Maspac is most often specified because of its shape and physical properties. Its overall shape provides high flooding limits and low pressure drop to high liquid and gas flow, enabling minimum blower requirements. The shape has an extra large surface area confined in a small space to provide high gas-liquid contact efficiency. Super saddles are similar to Intalox saddles in shape but has higher surface area compared to Intalox saddles. High surface area increases the efficiency and improves mass transfer between liquid and gas. These saddles still offers low price compared to other modern packing. VSP®, also known as Arch Ring, has arch slotted from one sheet of metal. Its spherical shape offers good surface area to void space ratio. 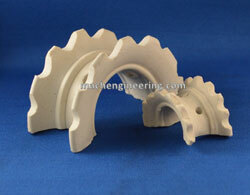 The sizes of Arch Ring are proportional in all dimensions for accurate scale-up. Heavily ribbed main element provides high strength-to-weight ratio sufficient for high bed heights. This type of design helps the liquid to form tiny droplets as it trickle down the packing, assuring good liquid-gas mixing and distribution. Its shape allows virtually no nesting and large void space produces low-pressure drop across the bed. 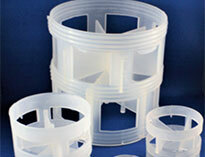 Interpack®, also known as Metal Conjugate Rings, have characteristics of both sphere and cylindrical shape packing. Sphere shape offers good surface area to void space ratio and cylindrical surface provides low height to diameter ratio. Its shape allows higher bed heights with little deformation and low-pressure drop across the bed. 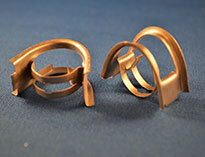 Metal Saddle Rings has similar shape as IMTP®. Metal Saddle Rings provide better mass transfer efficinecy and lower pressure drops than comparably sized traditional metal packings such as Pall Rings. 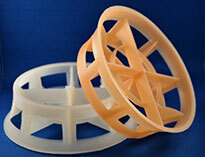 Metal Saddle Rings offers an excellent choice for high capacity applications that demand high performance packings. 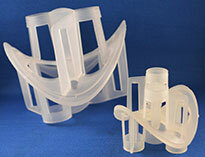 MACH Hi-Rings are equivalent to Hiflow® Ring and improved Pall Ring tower packing. 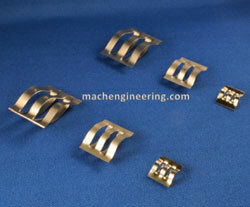 MACH Hi-Rings offer low pressure drop, small specific gravity, large void space, and high mechanical strength. Hi-Rings are widely used in petroleum and chemical, alkali chloride, gas and environmental industries. 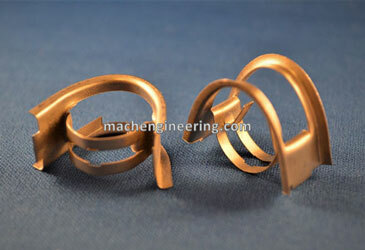 MACH Super Ring is equivalent to Raschig Super Ring®. 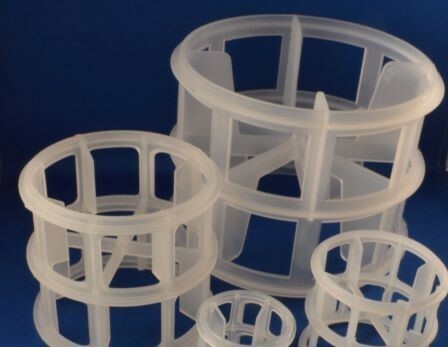 MACH Super Rings are open at all points, have many contact points for homogenous gas and liquid distribution, prevents entanglement of the packing within the packing, and are suitable for liquids contained within solids. 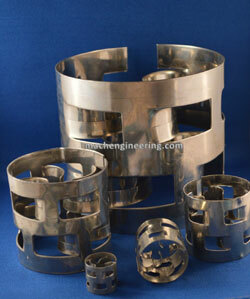 MACH Super Rings are used for many mass transfer and heat transfer applications. Tri-Packs®: One of our most popular products, Tri-Packs are a high-performance random packing material suitable for use in scrubber, degasifier and stripper applications. MACH Mini Rings: Cylindrical MACH Mini Rings have linear internal braces and a low height-to-diameter ratio that ensures even flow and better gas/liquid contact. 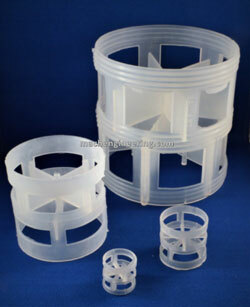 Plastic Pall Rings: Plastic Pall Rings have been a mainstay in tower packing for more than 40 years. 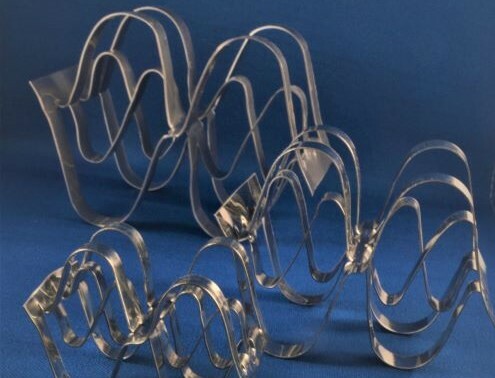 We offer our products — an improvement on the original Raschig ring design — in a variety of polymers and sizes to support different applications. Metal Pall Rings: Metal Pall Rings provide improved corrosion resistance and better performance in high-temperature applications. 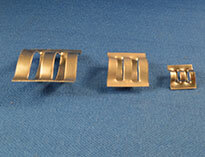 Various stainless steel, carbon steel, and aluminum options are available. 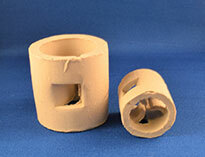 Ceramic Pall Rings: Ceramic Pall Rings are thicker than their plastic counterparts and offer better absorbing efficiency. Maspac: Maspac is a high-performance packing with a unique shape engineered to reduce pressure drops when handling very high liquid and gas flows. Our product preserves this original design, enabling excellent gas-liquid contact efficiency with minimal blower requirements. Ceramic super saddles: Similar to competitors’ products but with a wider surface area, our ceramic saddle tower packing media improves mass transfer and efficiency while still offering a low price point. MACH Corrugated structured packing: Corrugated structured packing consists of specially designed metal sheets that promote gas-liquid contact. Our corrugated packing is ideal for separations with a large number of theoretical stages or a wide operating range. 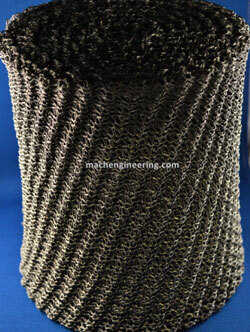 Knitted wire structured packing: Our knitted wire structured packing has minimal HETP requirements that enable lower tower heights while still delivering high separation efficiency and lower pressure drop. VSP®: VSP, or Arch Ring, is a type of random tower packing with a spherical shape and good surface-area-to-void-space ratio. It can provide efficient liquid-gas mixing with no risk of nesting. Interpack®: Interpak metal conjugate rings combine the performance characteristics of spherical and cylindrical tower packing media. Use them in towers with higher bed heights that would be subject to deformation and pressure drop with other media. Metal saddle rings: Our metal saddle rings offer similar performance in high-capacity applications to comparable competitor alternatives. 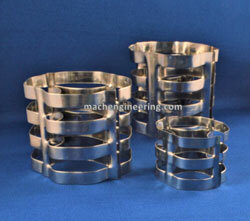 MACH Hi-Rings: Our Hi-Rings are widely used in chemical, oil and gas, alkali chloride and environment applications. They offer low specific gravity, large void space, and high mechanical strength. 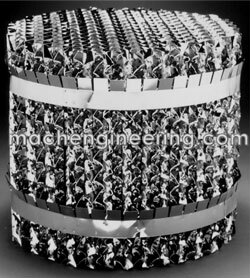 MACH Super Rings: Our version of the Super-Ring, MACH Super Rings feature an open design with many contact points to promote homogenous gas and liquid distribution. 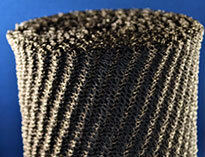 Use them in a wide range of mass transfer and heat transfer applications. We’d be happy to work with you to identify the best tower packing options for your project — whether you’re retrofitting an existing vessel or building something new. Contact us to request a consultation today.